Immaculate Virgin and Queen of Carmel, you are the hope of the suffering and the consolation of the afflicted. Look not upon my sins, but remember only that I am a poor soul redeemed by the Precious Blood of your Son, and that my heart is sealed with your Son, and that my heart is sealed with your holy Scapular. Hear my prayer and if it be for the glory of God, your honor and for the salvation of my soul, grant what I ask in this Novena. Amen. Prayer. The beauty of Carmel and the Glory of Lebanon are given to you in your Immaculate Conception, O Blessed Queen of Carmel! I also rise from the sea of this world, not like you all pure and Immaculate, but full of sin. Help me, look upon me with your eyes of mercy. Amen. Prayer. 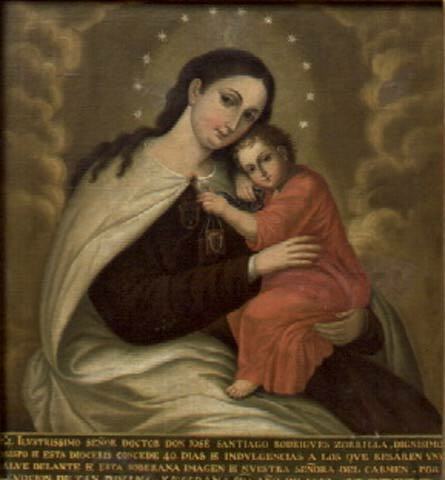 I give thanks to you O Virgin Mother of Carmel, for the gift of your holy Scapular, the sign of your Confraternity: O my Mother, make me worthy to wear your sacred livery, and may my heart ever be pure, free from every stain of sin. Amen. Prayer. Virgin Mother of Carmel, remember me who am consecrated to you by the holy Scapular, I place my trust in you, O Flower of Carmel, Fruitful Vine, Ever-Immaculate Queen. O Mother mild, implore your Son to hear my prayer now and at the hour of my death. Amen. Prayer. I thank you my Lady and Mother, for the gift of your holy Scapular. You know well my weakness and my malice, but I trust in you and under your protection I take refuge. O holy Mother of Mt. Carmel, despise not my petitions in my necessities, but deliver me from all danger. Amen. Prayer. Queen and beauty of Carmel, your glance is love, hope and sweetness. As the rays of the sun color the flowers, so also your glance gives to the soul strength and beauty. May I remain ever before you my Mother, and turn your eyes of mercy on me. Amen. Prayer. O dear Mother of Carmel, I love you more than I can express, more than my very soul can conceive. I reverence you, I praise you, O sacred Virgin, whose chaste womb bore the Son of the Most High God. Bless me and deliver me from all evil. Amen. Prayer. Most loving Virgin of Carmel, I acknowledge gratefully your immense goodness towards me; hear my prayer and after this my exile, show unto me the blessed fruit of your womb, Jesus, O most clement, O most loving, O most sweet, Virgin Mary. Amen. Prayer. O Mother of Carmel, when my last hour shall sound; when I shall take your holy Scapular into my trembling hands, fill my heart with confidence in it, and O my loving Mother, receive my soul and offer it to your sweet Jesus. Amen. Prayer. O Mary, most holy Mother of Carmel, Virgin of Virgins, Sanctuary of the Blessed Trinity, Mirror of the Angels, Assured Refuge of Sinners! Have compassion on me in my sufferings, listen to my sighs with clemency, intercede for me with your Son. Amen.